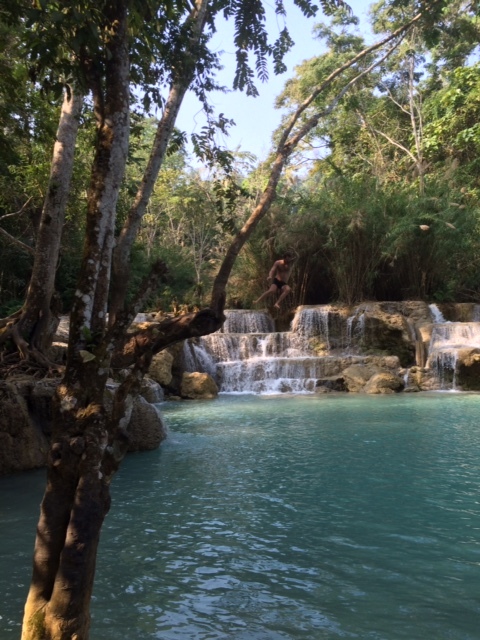 I rarely return to the same place twice as there are just too many new destinations to discover, but if I am in South East Asia and have a few extra days I try to stop in Luang Prabang, Laos. It is an old royal capital influenced by colonial French architecture, lovingly restored, retaining an air of a small provincial town, yet well supplied with tourist infrastructure, from affordable youth hostels to luxury hotels and with a great culinary scene; from small cafes to five star restaurants. 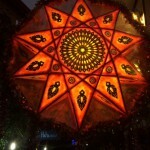 Oh, and for those who enjoy shopping, the gamut runs from cheap Night Market stalls to upscale designer boutiques. 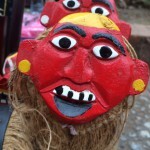 Though this is a Unesco designated Heritage town it is not a museum for tourists. Real people still live here: tending their little shops, going to the morning market, while kids go to school and monks to prayers. My husband claims I enjoy it so much because this is one of the few places where I don’t get lost. Even for a person with an abysmal sense of direction like me this is an easily navigable place. The heart of the old town lies on the confluence of two rivers- Mekong and its baby sister Nam Kham. It is intersected by two straight roads and interspersed by smaller perpendicular side streets and alleys. In the middle there is a small hill (Pousi Mountain), a green beacon that shows the way. Being a rather impatient person I tend to hop from place to place in my travels, rarely stopping for more than a few days. I like to get up with the dawn, ticking off sights: monasteries, museums, botanical gardens…If at all possible my husband and I like to rent a car even in the most challenging of places and drive off, exploring every dirt road. But Luang Prabang always puts a special spell on me. I enjoy just wandering around without a map or a big plan. 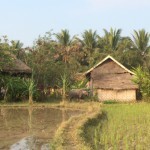 Or maybe renting a bike and pedaling on the roads with very little traffic but an occasional motorbike or large tuk tuk. Every corner brings a new view and something lovely to behold: a spray of colorful bougainvillea against a wooden door, a rickety wooden rack with rice cakes drying in the sun. 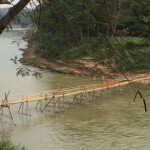 A black cat on a white wall, a blue longboat on the muddy brown river, a slender bamboo bridge with monks in bright orange robes crossing to the other side. The orange robed monks with their ubiquitous umbrellas and shoulder bags are everywhere; laughing in the golden courtyards of the Buddhist wats, chanting in the solemn sanctuary under Buddha’s loving gaze, strolling along the smaller river, reading under the Frangipani tree. Invariably they are mostly young novices who came to study in this important Laotian religious center, but as young boys everywhere they are full of life and a little bit of mischief. They bring great merit to their families to join the monastery, if only for a short period of time. They are not precluded from practicing English with the foreign tourists or learning about computers at the local library. Their time is not just fun and games, though, they must rise way before dawn at about 4:30 am when the drums announce the beginning of prayers. Before the first sun rays lick the golden spires and mirrored mosaics on the wats they have had already collected their daily alms, barefoot and shivering in the morning mist. Their last meal of the day is taken at twelve noon. The places of most interest, architecturally and artistically are the many wats, and nobody should miss the most intricate of all- Wat Xieng Thong. There is much history and storytelling within those walls, but you can also enjoy it purely on the artistic grounds. It is a jewell in the crown of old quarter. Luang Prabang is also a thriving artisan center, in particular when it comes to revival of the silk weaving. I am no expert in textiles but after traveling extensively and admiring the patience and artistry of weavers around the world, I am most taken by the Laotian silk. With the help and support of a few Western women aficionados the old traditions of hand weaving, intricate, symbolic design and natural dying have burst alive again. There are quite a few stores that source hand made silk from village weavers and a workshop at Ock Pop Tok where you can be enlightened as to the complicated process from start to finish. They encourage traditional and also create contemporary designs. 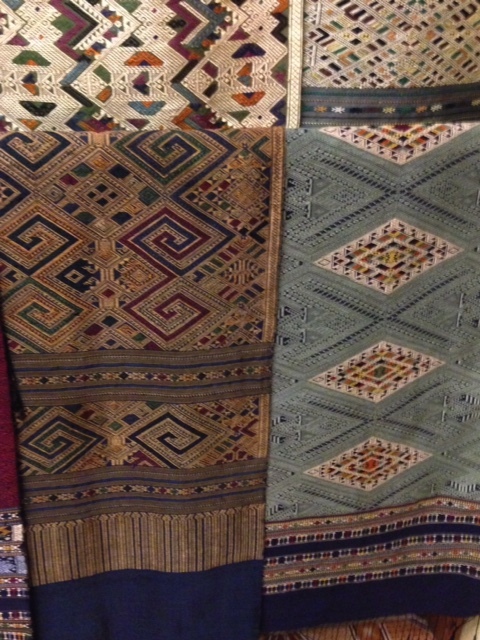 And if just admiring and touching a beautiful piece of weaving is not enough, the prices are not so astronomical that you could not bring home at least one beautiful wall hanging for only a few hundred dollars. 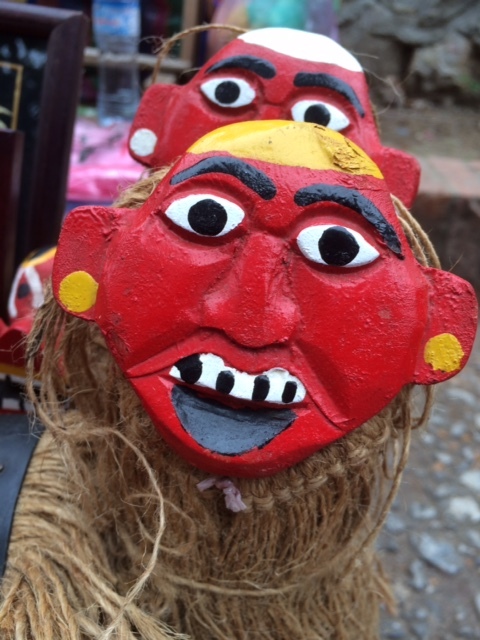 On the other hand if you are just looking for some small, colorful gifts, the Night Market is your place where a few dollars can buy you small trinkets. While in recent years the market has ballooned and many of the merchants are selling the same items side by side, there are not a lot of Chinese products flooding the stalls like in many other Asian markets. In fact you can still see some Hmong women hand stitching their patchwork handicrafts. One of the most authentic experiences is going to the morning food market close to the Royal Palace grounds. Warning: it is not for the faint hearted as there are many things for sale that we do not consider the least bit inviting. 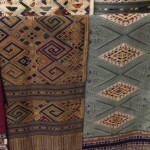 In a typical fashion the sellers carefully set up their few wares on a piece of cloth on the ground. A number of them had fresh or fried field rats (never town rats! ), live frogs, crayfish, dead baby birds, even a wild civet. 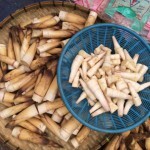 On the more palatable side there were a number of wild mushrooms, different kinds of blossoms, bamboo shoots, many kinds of green lettuces, dried fruit teas, and bags full of rice in hues of white, brown, pink and purple-black. Indeed on the banks of the river and in the hills surrounding the town there are many small thriving organic farms which supply fresh food to the restaurants in town. Undeservedly so Laotian cuisine is not very well known in the West, though many dishes we like to eat in Thai restaurants are by origin Laotian. While we reveled in wonderful sticky rice and dipping sauces, we also enjoyed a number of interesting fish and buffalo dishes. Our favorite appetizer was crispy river weed called khaiphaen, which was also the name of our favorite restaurant. With fresh, organic ingredients and some contemporary twists the meals were very much enjoyed and flushed down by Beer Lao or innovative and inexpensive cocktails. After a few days of rest you might be ready for a little adventure. 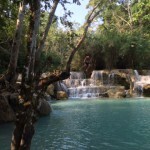 Your best excursion is to the Kuang Si Waterfalls. If you can, start your day early before the tourist groups descend. You can have the multilevel waterfalls with their green blue waters all to yourself in quiet contemplation and awe. The walk is comfortable and well designed and you can swim in the lower pools if it is warm enough. Just before the waterfalls trail you should definitely stop to admire the playful Asian Sun bears in their well designed rehabilitation enclosure and on the way back you could visit the new Butterfly center and stay for lunch in their lovely garden. Many people also take a half day boat trip to Pak O caves. 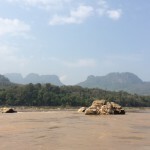 It is a very relaxing trip on the mighty Mekong river with lovely mountainous landscape ahead, but the caves themselves are not very impressive and neither is the stop at the local village along the way where lots of tourist stalls are set up. 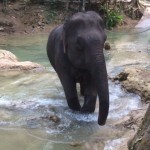 Recently many elephant centers and encounters have popped up around Luang Prabang area. While seeing elephants up close and personal is exciting and memorable, they are not always treated with kindness by their handlers. Please refrain from riding on the back of the elephants as it is damaging to their spines. The only acceptable way to ride is just behind his neck. Compared to many SE Asian destinations Luang Prabang is very relaxed, and surprisingly uncrowded. The local people, be it Lao, Hmong or Kmu are very pleasant and welcoming and they love practicing English. If you want to get to know young people and learn more about their life and aspirations you can spend a few hours at Big Brother Mouse or at The Library volunteering to help with English conversation. It is a wonderful way to learn about a country and give a little back. 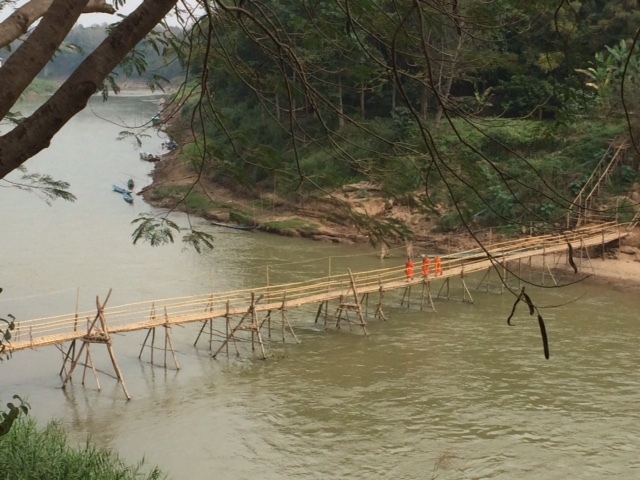 This temporary bamboo bridge over Nam Kan river in Luang Prabang, Laos get’s rebuilt every year after the seasonal floods recede. Monks, city dwellers as well as tourists cross it daily. 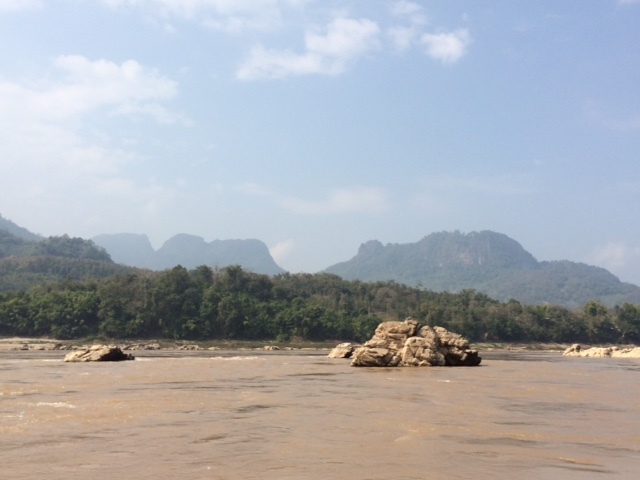 Taking a leisurely boat ride on Mekong River up to Pak O caves is a pleasant experience with an ever changing scenery. You will see distant mountains, villages, gardens and towards the evening upon your return villagers washing dishes, doing laundry and bathing. A visit to the local marketplace is a special treat as very few markets in Asia retain the true natural flavor of local production. Here you will find mostly local women sellers and buyers with all sorts of daily staples like different varieties or rice, vegetables as well as wild mushrooms and some less palatable items like crickets, frogs, and fresh or fried field rats. 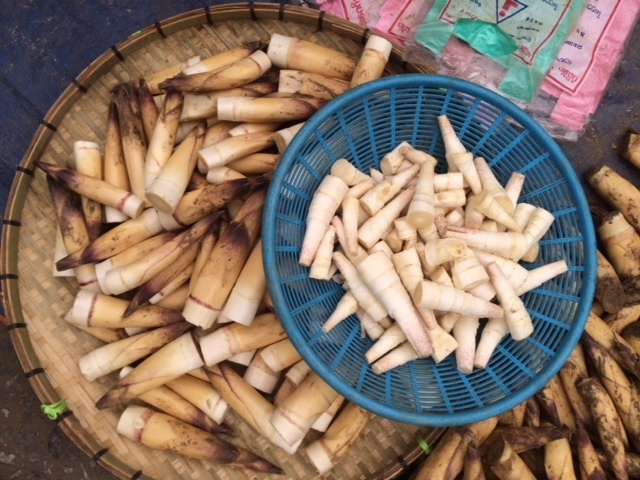 A very Asian food-young bamboo shoots will find their way from the local market to the many excellent restaurants in the town of Luang Prabang. Much of their food is still grown organically and sustainably and retains intense flavors and colors lost in the Western agriculture. 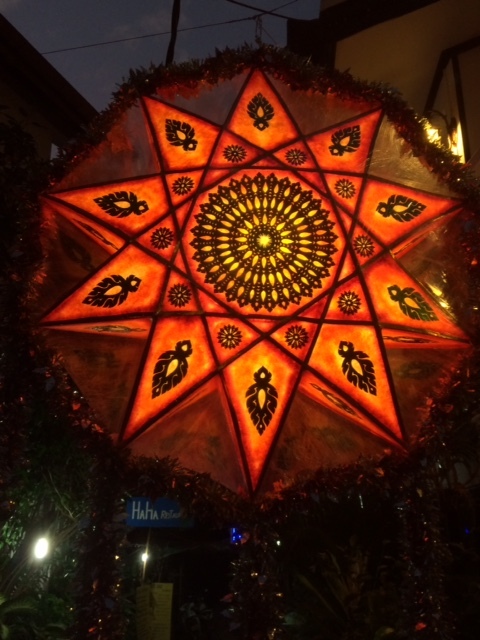 The Night Market as well as many local shops and boutiques are full of beautiful and colorful handicrafts from hand made mulberry paper lanterns to intricate silk weavings. The resurgence of hand woven silk textiles in traditional and modern patterns is vibrant and fascinating and even the highest quality weavings are quite affordable. It is difficult to decide which pattern and colors are favorite. The multitiered Kuang Si waterfalls with their green blue waters are spectacular and a refreshing stop during the warm mid day. 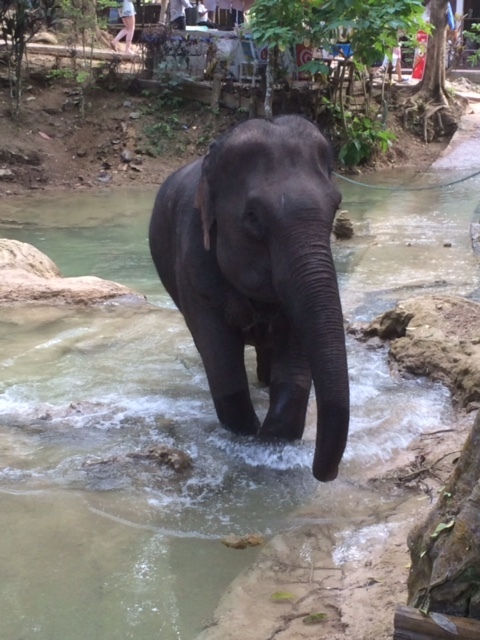 There are a few places in the vicinity of Luang Prabang where you can see the Asian elephants. They are smaller with shorter ears than the African elephant and they can also be tamed, touched and fed. It is not advisable to ride on the elephant’s back, except if seated right on the neck as the weight on their back damages their spine. 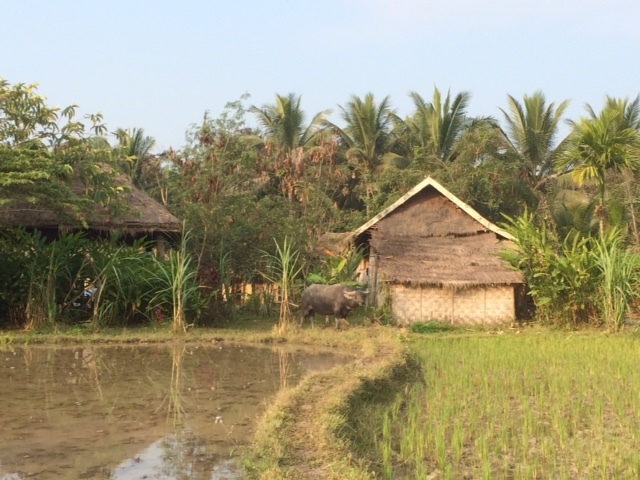 Just on the outskirts of Luang Pabang you will come across untouched villages where rice is produced collectively by family hands, the water buffalos are the only extra force and houses are made by local materials such as bamboo mats and reeds.